I wish I could say that I’d won a BAFTA. As I have nothing to do with the British Film or Television industries, however, if I did then I’ve accidentally fallen through to a parallel world in which they award those things to 16-year-old girls for absolutely no reason. But I did win two blog awards… from Liam. Is ‘win’ the right word? You don’t really associate it with blog awards as they’re generally given to whoever you didn’t give them to last time, but I can’t think what else to call it. Anyway. The Kreativ Blogger Award. Yeah, we’re so kreativ here, we got bored of spelling. Also, pink? On my blog? Are you serious? Oh, and there are rules. Rules! Screw the rules, I do what I want! But apparently, I have to answer questions first. And then pass it on to seven people. Seven? I can’t even think of seven people. Sheesh, what is this? What is your favourite song? I’m going to take it that ‘song’ means ‘thing with words’ rather than ‘piece of orchestral music’ which narrows it down a lot, as I don’t listen to that much other than soundtracks and Shostakovich. Um. Song. Well, I do really like “Show Must Go On” by Queen because it’s amazing, but… I think it’s going to have to go to “One Day More” from Les Miserables. Today. It might change tomorrow. What is your favourite dessert? Jelly. Or ice cream. Or jelly AND ice cream. Or Victoria Sponge. Or chocolate sponge. Hmm, I just like pudding, I think. What ticks you off? People, usually teachers. Ridiculous exam board rules (no labels on your water bottles in Art exams! No talking for ten hours in Art exams! You can’t leave this hall until 10am even though the exam finished at 9:25am!). Sucky internet. Grammar fails. When you’re upset, what do you do? Rant. Beat something up. Play miserable music on the flute. Write death scenes. Beat someone up. What is your favourite pet? I want a penguin. But, you know, an 8-legged horse will do. Or a dragon if you can’t get Odin to sell it to you. Which do you prefer: black or white? It depends why I’m choosing. Clothes? Black, it doesn’t go see-through when it gets wet. Bedroom walls? White. Characters? You stupid racist award, go away. What is your attitude? Erm, generally pretty cynical and sarcastic about stuff, I think. Also frustrated. I get frustrated quite easily. But I try to stay optimistic. Maybe I’m just stubborn. What is perfection? A word. What is your guilty pleasure? Tumblr, mainly. I am most definitely Loki’d. And Sherlocked. I think it’s the cheekbones. I have a little wooden artist’s manikin thing standing on my bookshelf (currently in a pose that suggests nothing as much as JAZZ HANDS). She’s called Sylvia. I saw the Avengers last week. It was so good that I’m considering going to see it again on Friday. SERIOUSLY GUYS SEE THIS FILM. When writing revision notes, I don’t colour code things, I just changed coloured pens for every page to stop me from getting bored. My favourite gel pen for History or Biology revision notes is the red sparkly one, but unfortunately it’s running out. My favourite gel pen for Chemistry or Physics revision notes is orange and sparkly. Also running out, although not so fast. Those subjects are the only subjects I have left this year and then I am FREE for a whole summer. I hate studying sciences and am dropping all of them after my exams. I already dropped maths. I’m also dropping one of the languages I learn (not 100% sure which, yet), History, RS and Art. I think that’s everything. I plan to teach myself Old English this summer. Not Middle English, proper old English. Like, Beowulf and all that. Just because I can. Hmm, a much more attractive little icon yoke. This one has rules too. Whoever invented these awards had a serious control-freak thing going on. If I made up an award, it wouldn’t have RULES. They constrict us, hold us in! Why would you do something like that? Just… why? Don’t worry, readers. I SHALL MAKE THEM KNEEL. You must give this award to 5-10 other lucky book blogs you adore. Ha, funny you’ve given this to me here. I do actually have a separate book blog. It’s a Blogger one too – shocking. Five of my favourite books? Too difficult. (Honourable mention!) Out Of The Silent Planet by CS Lewis. Three of those are about fairies. I give up. I wanted to put something really high-brow on that list so you’d look at it and think, “Oh, what a well-educated and cultured girl this is! Let us talk to her and give her a book deal because she has such good taste!” But to be honest, YA fic is at least as good as adult fic, if not better. And these are all awesome books. (Also, Hitchhiker’s Guide is totally high-brow. I mean, it’s too awesome not to be. That’s how it works, right?) So I had to have an honourable mention to prove that I do stray out my little corner of the library sometimes. Okay, for the first award, because she’s highly kreativ, I nominate Cathryn. Again. I really don’t follow enough people for this whole award thing. I also nominate Cassie Behle, who is completely hilarious. And Miriam Forster because she is funny and she is called Miriam. I can’t think of four more people. Three will have to do. Well, I give Charley an award every time I get one, so I’m not going to do that this time. Sorry Charley. I guess it’s been a while since I gave one to the team at Mark Williams International, so they can have an award. I’m sure they won’t do a post, but who knows? Maybe Mark will deign to give us a peek at his five favourite books. And the award also goes to Pheris-Perhis- how the HELL do you spell your name? Pherisphena Ladea of The Word Asylum (because she writes so I’m sure she talks about books sometimes), for being a member of Loki’s Army and making me laugh regularly on Twitter. And that will do. I do not need to nominate a whole 7 + 5>n<10 other bloggers. BECAUSE I DO WHAT I WANT. Ugghhhh what is wrong with me today? This post has so many capitals and random Loki quotes and generally failure to put across a professional, writerly persona. Never mind. That doesn’t matter. Puny humans, thinking you can give me RULES. We saw the Avengers last Friday – it was excellent! The Hulk definitely played a pivotal part in the hilarity of that movie. But Loki stole the show for me. I … I’m not sorry. The part where he shakes Loki was my favorite because it reminded me of a Man, Woman, Wild episode where Ruth befriends a chicken and then Mykel takes it and whirls it around haphazardly until its neck breaks. Classic. *snorts* I just liked it because it was amusing. Am I Kreativ because of my spelling issues, or because you think I am creative… which reminds me I have other creative occupations I need to get back to. Well then… Um… I suppose I could do a blogger award for next weeks post. Today It’s about Beautiful People… when I get a chance to get it up. Incidentally, I love that you mentioned Out of the Silent Planet. I’m always excited when I find someone else familiar with the Space Trilogy, because it doesn’t get quite as much press as Narnia, and it should. I LOVE the Cosmic Trilogy. I first discovered it via my dad although he’s only got one of the books (which I stole from him) so I had to get them from the library :) Although, the third one gets a bit weird. With, you know, Merlin and that. To be honest, it would be harder for me to find somewhere where I HADN’T made that comment in the past week than somewhere where I HAD. It is EVERYWHERE. It is INSIDE MY MIND. Hehe, I keep doing Avengers quotes all over the place right now … I think it’s infectious. *jumps out from behind door wearing silly helmet* ME! *growls* I have an army…. I have a high functioning sociopath, do your research. This is my thingthing detector. Goes ding when there’s stuff! Oh, don’t try and quote at me, you lower the IQ of the entire blog. GO BACK TO THE SHADOW, SOCIOPATH! YOUR DARK FIRE WILL NOT AVAIL YOU! Ah, but you forget. I have an army. Ah, but you can’t kill an idea. I believe I have emotionally compromised you. And so I win! I always had! I’ve won! I’ve beaten you! You’re a Loki fan, as well? Ha, yes she is. We had a 90 minute video chat (which was pretty much as nerdy as this comment thread, if you can credit that. 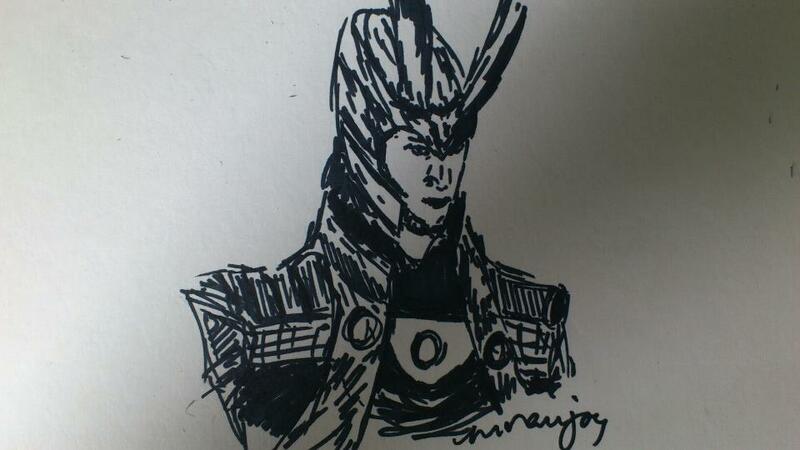 About 80 minutes of it was just fangirling over Loki! Both of us are – bigtime. LOKI FANS FOREVER! LOKI FOREVER AND EVER. Even if he isn’t the main antagonist in the next movie. :c WE DO WHAT WE WANT! Love Loki :D Went to see the Avengers again today and spent the whole time fangirling over Loki and the soundtrack! Ahahaha, I’m sorry. My name is incredibly obnoxious, I know. LOKI. You drew that? I need it. So I can, like, put it all over my house. I make you laugh? Really? Seriously? *commence happy dance* Twitter is where it’s at. At least for Loki’s Army. Hee hee, yes I drew that. I’m planning to do more of them when my exams are over. I JUST SAW THE TAGS.